Walk through ZooLights, the Oregon Zoo’s twinkling magical winter wonderland of more than 1.6 million brightly colored lights, while drinking local beer and wine. For two nights in late November (Nov 27 and 28), the zoo will host its popular BrewLights event: a ZooLights experience just for the 21-and-over crowd. Visitors can sample local beers, wines and ciders while strolling among forests of brightly lit trees and dazzling 3-D light sculptures. BrewLights tickets will include a souvenir cup and complimentary tastings throughout the zoo. There will also be live music and animal meet and greets. Come hungry! Food from some of your favorite local food trucks will be available for purchase. If you’ve ever thought that ZooLights would be more enjoyable without all the kids, you won’t want to miss it. BrewLights is exclusive to guests 21 and over. Valid photo ID must be presented for entry. Festivities begin at 5 p.m., and gates stay open until 9 p.m. Visitors may remain on zoo grounds until 10 p.m. 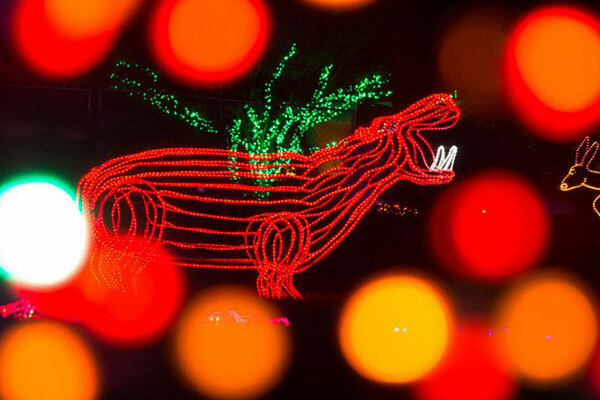 The zoo will close to regular visitors at 3 p.m. on Nov. 27 in preparation for BrewLights. Guests can remain on grounds until 4 p.m. Proceeds benefit the zoo’s programs for conservation, education and animal welfare. Trying to decide what to do in Portland? Check out events like this nearby our downtown Portland boutique hotel. A stay at Hotel Eastlund means you’ll be right across the street from the Oregon Convention Center, next to the Moda Center and have easy access to the best destinations, restaurants and attractions Portland has to offer. Whether you’re here for business, pleasure, or seeking event spaces in Portland, we look forward to helping you discover this beautiful city.